Bell’s Diner is something of a Bristol restaurant institution. Located on a corner site in the Montpelier area of the city, it first opened its doors under Shirley Anne Bell in 1976 as a French bistro style restaurant, which was popular with a largely student crowd. 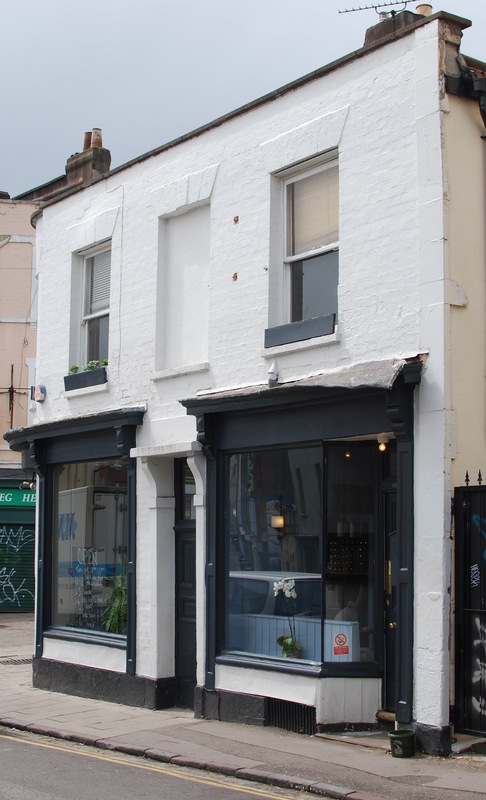 Later, after a period as a vegetarian restaurant and then, once again a French bistro, in 1997 it was bought by chef Chris Wicks whose menus had more of a fine dining style and combined classic cooking with cutting edge culinary techniques. So it remained, until the beginning of this year, when it was announced that Bell’s was once again up for sale. Step forward chef Sam Sohn-Rethel, ex Moro, Lido and Flinty Red whose absolutely belting cooking at Manna had made it by far my favourite Bristol restaurant. I was sad to hear he was leaving, but excited when I found out he was taking over Bells, which is closer to where I live and much more importantly, downhill, although thinking about it, that’s going to be a real embuggerance when rolling back home afterwards, stuffed silly and drunk. When the restaurant re-opened under Sam, I was abroad, doing my best to eat the Spanish out of all of their grub and drinking much of their sherry but I headed over to Bell’s as soon as I arrived back, for a solo lunch last week and then went there again, the very next night for dinner with Elly. I think you can probably ascertain from the double visit that I thought it was a bit good. So, let’s get it out of the way early. This is undoubtedly my new favourite Bristol restaurant. From the outside things looked more or less the same. However, stepping through the front door into what was once the reception area, there now sits a small bar, which is a good use of the space. I always liked the front dining room at Bell’s; it’s a lovely space and taking a seat at my table it’s apparent this hasn’t really changed. Sam’s cooking style here remains exactly what made me such a fan at Manna. 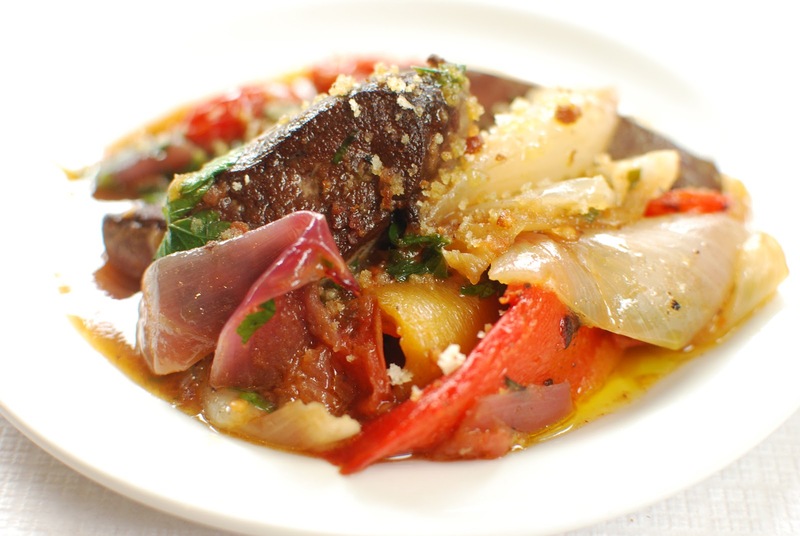 Spanish-North African and Mediterranean flavours with a bit of classic British thrown in for good measure all put together with top quality ingredients. He’s continued with the small plate dining format, but there are some larger, pricier dishes here too. A Big Green Egg BBQ in the kitchen means charcoal grilled ingredients feature throughout the menu. As with Sam’s previous restaurant gig, a British artisan cheese section on the menu gets a massive thumbs-up from me. Bearing all this in mind, I settled in for what I expected to be a cracking lunch and proceeded to order a few dishes from the small plate menu. First up, some bread, baked on site by their pastry chef. It had a nice springy texture and a beautiful chewy, marmitey crust. Cracking stuff especially when lavishly smeared with rather luxurious Abernethy butter, which is apparently handmade in Northern Ireland. 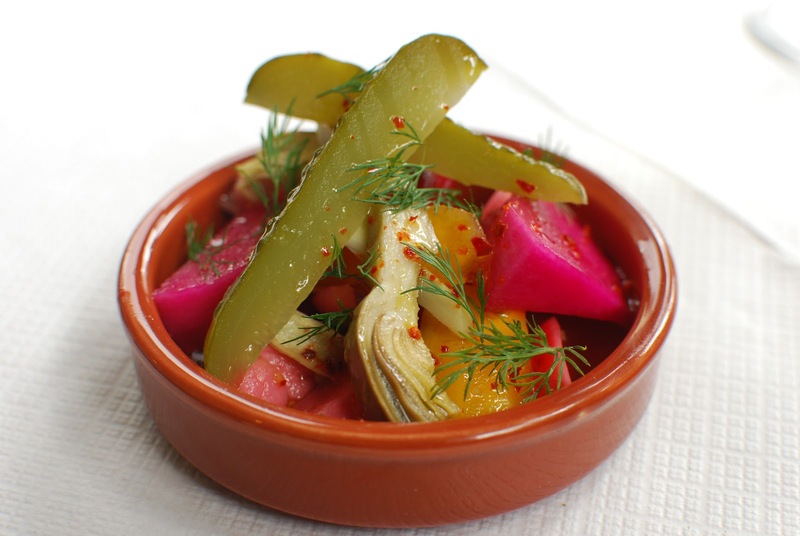 I picked at a beautiful looking bowl of house pickles as my food started appearing from the kitchen. 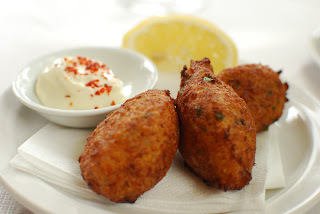 First up, Salt cod fritters with a mayonnaise dip, simple, well made and absolutely delicious. Next, a lighter dish of broad beans, cumin yoghurt, Israeli couscous and coriander. 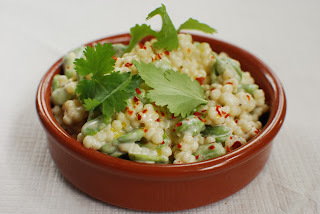 The texture of the couscous was phenomenal, large individual beads, unlike the fine grains I’m normally used to. Again, lovely stuff. 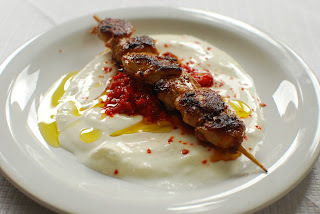 A small plate of Charcoal-Grilled Chicken Oyster Pincho, marinaded in Chipotle with Harissa Yoghurt impressed me no end. As you’re no doubt aware, chicken oysters, the tender tastiest pieces of meat, located underneath the bird are highly prized by greedy bastards in the know. Here in front of me, as if in some delirious meat laden dream was a load of them, threaded on a skewer spiced and chargrilled. Unbelievably good. But not as good as a plate of Kid’s Liver, Charcoal Grilled Onions and Naga Chilli Pickle. I’ve never eaten goat’s liver before and true to my instinctive need to stuff all unknown items into my gob, this is what I went for and I’m chuffed that I did. It had a rich but mild liver taste, combined with the grilled onions and the almost toffee sweet heat of the chilli pickle. Absolutely banging. Loved every bite. 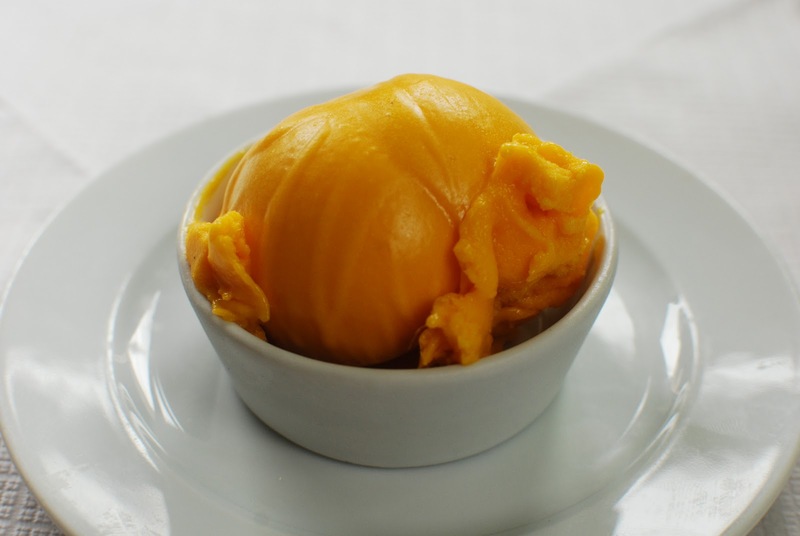 Finally, a lurid orange scoop of Alphonso Mango ice cream had a fantastic velvety texture and a superb flavour. As someone who has dabbled in the art of making ice cream on more than a few occasions I can tell you now, this was quality stuff. Would you believe, except the ice-cream at £2.50 a go, all of these dishes were on the lunch menu for £4 each? Or if that’s not a bargain of the instantly chew their arm off variety enough for you, how about 3 dishes for £10? We started off with more of the excellent house pickles, bread and stonking Abernethy butter and as it was a Friday (and we really need no encouragement whatsoever), we decided to crack into the plonk. Turns out the wine list is good and as much as a bargain as the food, with a general policy of adding about a £10 mark-up on the cost price. Deciding to get a starter each and ‘one for the pot’ I only had eyes for one thing, spied on the specials board as I walked in. 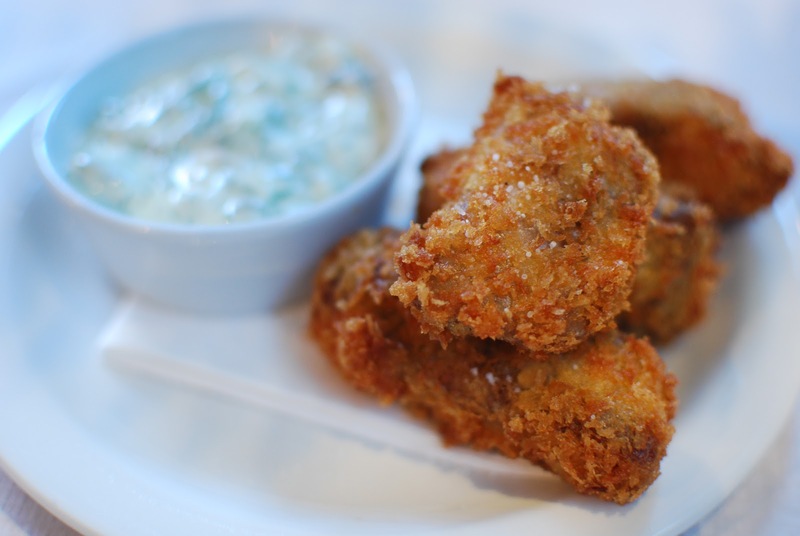 ‘Elizabeth David’s Lamb St Menehould with Tartare Sauce’. Get in my frigging belly. An absolute classic of breadcrumbed and fried breast of lamb. Any chef, who’s putting Lizzy David’s grub on the menu, can do no wrong in my eyes. It was amazing and at £3.50 they’re practically giving it away. 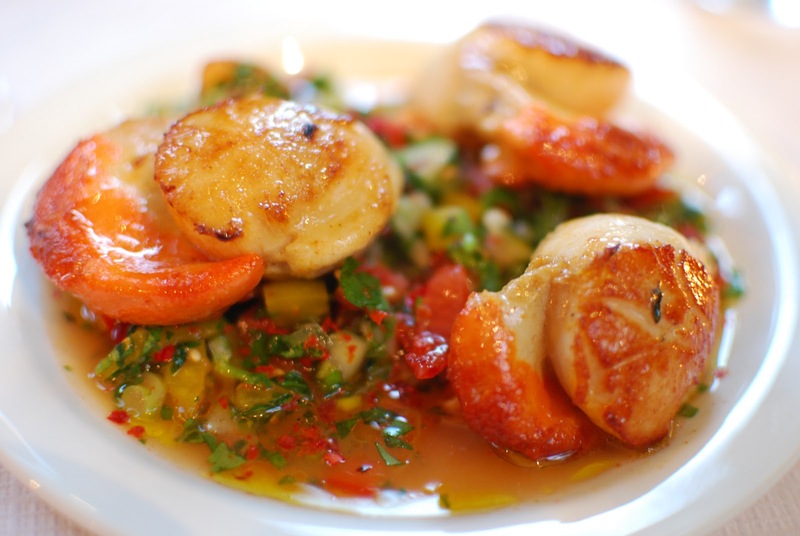 Meanwhile, across the way, Elly was wide eyed, surveying three huge seared scallops surmounting a plate of chopped summer salad. She’s scoffed a fair few scallops in her time and in her opinion, these were the best, the fattest and juiciest she’s had. Fair play. The sweetness of the scallops when eaten with the sharpness of the chopped salad was delicious. Our shared starter was a plate of Goat’s Curd with Tomatoes, Basil and Chilli. Fresh tasting and light, as with everything else, a cracking plate of grub. 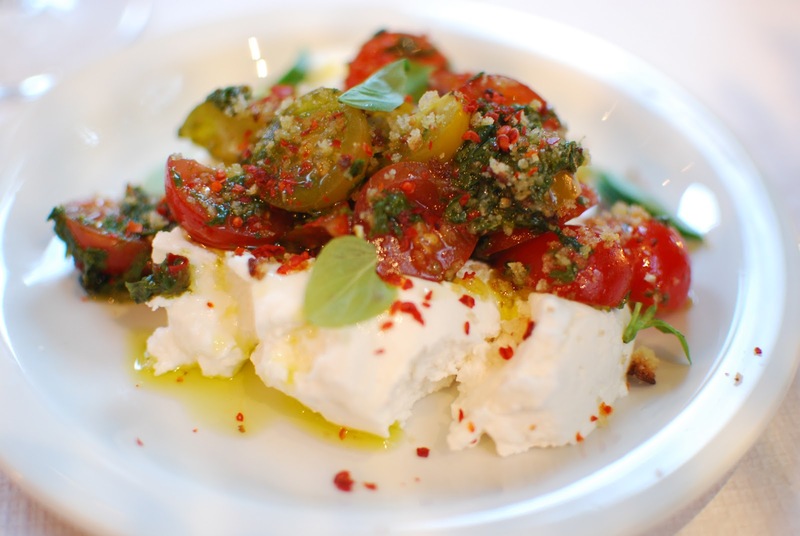 Later on in the year, if we actually have a summer, this dish can only improve as tomatoes get some warmth and sweeten. Elly’s main effort was directed at a plate of Handmade Westcombe Ricotta Ravioli, Roasted Cherry Tomatoes, Asparagus and Broad Beans which she demolished in no time, reckoning it good but not quite as spectacular as some of the other dishes we’d tried. 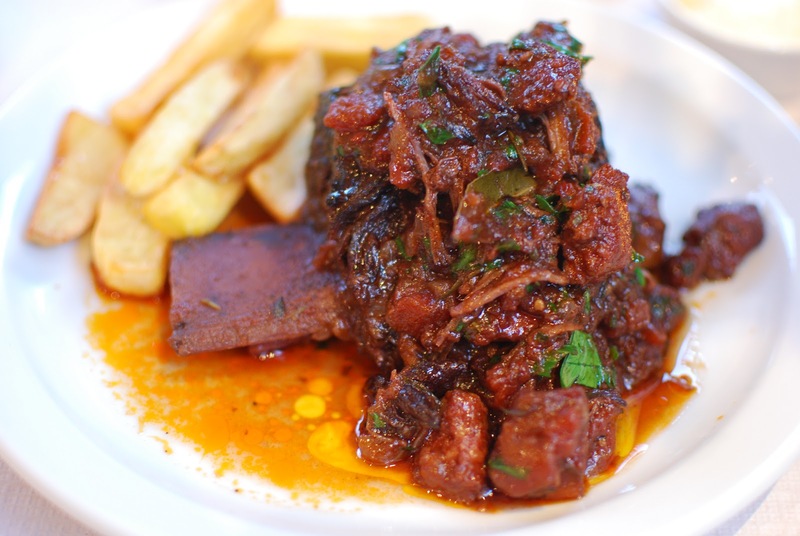 However, something else from the specials board, Short Rib of Beef cooked in Rioja with Chorizo. 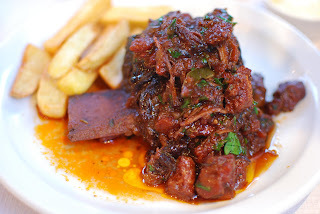 Slow cooked meat, with a bone sticking out of it? Yep, this one’s for me. Soft, rich, falling apart as sank my fork into it. Boody amazing. By this point we were both pretty stuffed and as I had been so impressed with the ice-cream at lunch the previous day, we had another go. This time, chocolate for Elly, which had the same beautiful texture and just the right level of bitter sweetness. I had Rum & Raisin (with neat rum poured over the top) so just the right level of borderline alcoholic to suit moi. 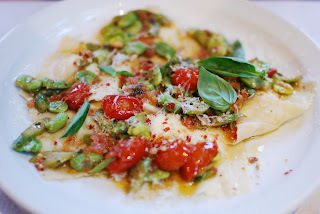 So, as I said right at the beginning of the review; By virtue of Sam’s cooking, Bell’s has instantly jumped to the top of my favourite restaurants in Bristol list, even after only being open for a couple of weeks, it’s really that good and it’s only going to get better, as they settle in. Sam is a seriously talented chef and it’s patently obvious from his menus and his grub that he absolutely loves cooking and eating. I really can’t praise it enough. Lovely food. Cracking restaurant. Get over there and enjoy it. 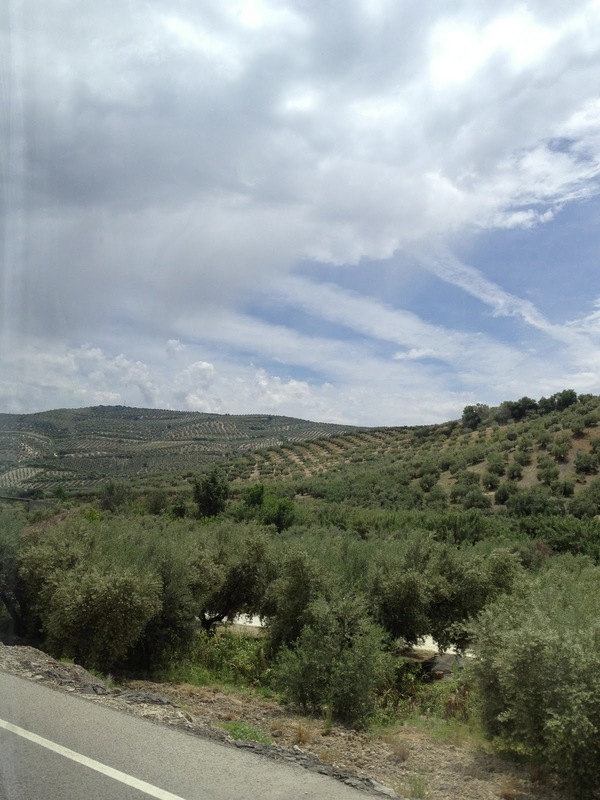 The surrounding countryside on the hour long bus journey from Córdoba provided a constant reminder of why I was travelling on this ageing coach in blistering heat. With my head resting against the glass, I watched reflected a continuous vista of olive groves stretching up and down in beautifully neat lines over the gently undulating hills, nothing else but olive trees, trailing off into the distance in every direction. Stepping off the bus, in an incredibly louche manner, I took in my surroundings, the rather sleepy Spanish market town of Baena, destination for a fair amount of the olives I’d seen on the journey, there to be squashed relentlessly and mercilessly at the hands of Núñez de Prado, makers of some of the finest organic olive oil you can get your grubby mitts on, which was exactly what I had in mind. Taking a swig of water and bemusedly studying the map on my phone, I wandered off aimlessly into town, accompanied by Elly, in search of the famous olive oil mill, determined to bluster, cajole, bribe or threaten my way in (as it turned out, there was no need for any of this, they happily let anyone in). Arriving unannounced in the oil mill office and enquiring about the possibility of a site tour I was a little taken aback to have the President of the company, Francisco Núñez de Prado (or Paco to his pals) stepping up to act as guide. 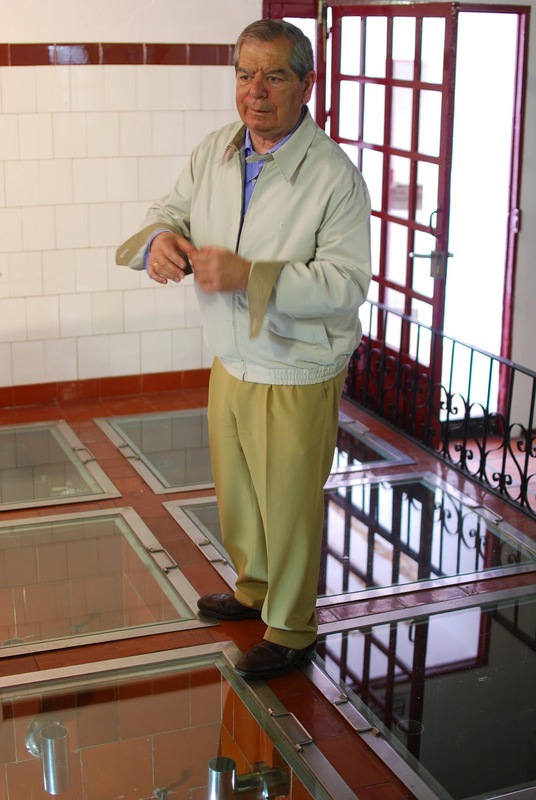 Joined by a handful of fellow olive oil tourists we were led around the mill by the extremely entertaining Paco, who explained the process in English, Spanish and French – with a little German thrown in, just for the sheer hell of it. 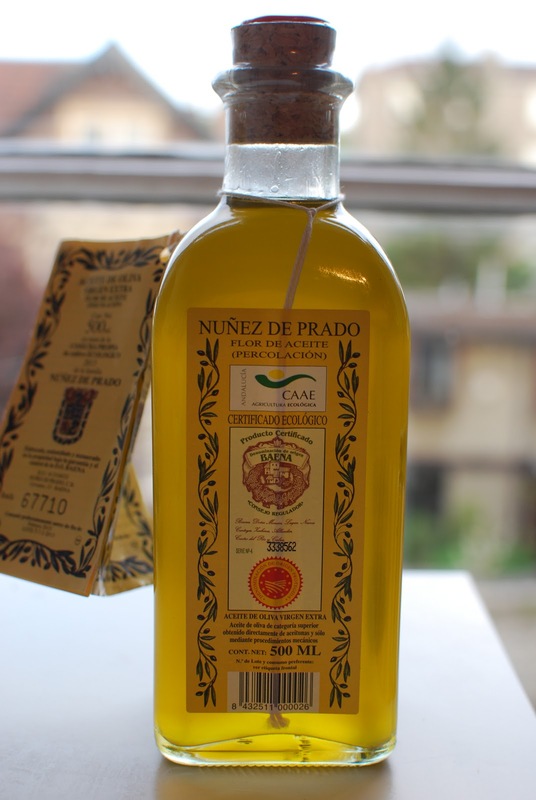 The Núñez de Prado family have been making Olive Oil for seven generations and have eschewed the use of chemicals in the growing process since 1986 being subsequently certified organic in 1990. Harvest season runs from November-January with 160 employees picking the olives entirely by hand ‘working really fast’. 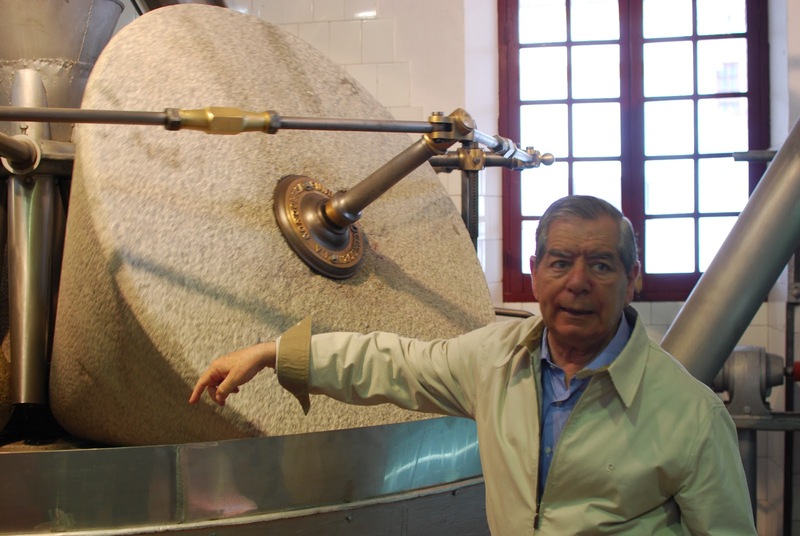 The olives are crushed in terrifying looking, rolling, heavy granite presses which date from just after the Spanish Civil War, in 1944 and were installed by Paco’s father. The resulting paste is then hydraulically pressed. 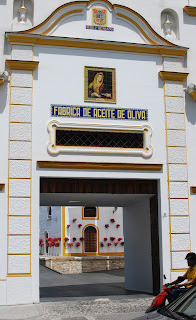 They only produce Extra Virgin Olive Oil and there is only a 1st cold pressing. 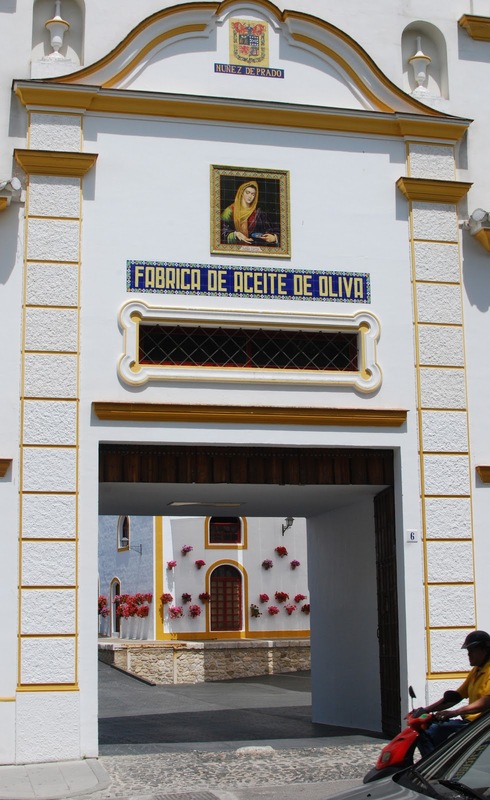 The company’s primo product is Flor de Aceite or ‘Flower of the oil’ a free run EVOO that is produced by squeezing the crushed olive oil paste between mats, 10 kilos between each mat with a total of a tonne being pressed at a time. The end product is the oil that seeps out. 11 kilos of olives are needed to make just 1 litre of this oil. 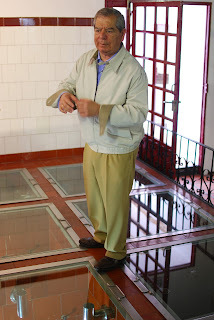 After pressing the olive oil is pumped into glass tanks that are hermetically sealed to prevent flavour contamination. As the oil sits, it separates naturally from the water, which is then pumped away. Nothing is wasted, this ‘black water’ and the leftover crushed, tasteless olive oil paste is combined and used on the olive groves as a fertiliser. The finished oil is then rested for a couple of months before bottling. And that is more or less that. We then got the opportunity to purchase some of this exceptional product at almost ridiculous knock down prices £4.25 for a bottle of the Flor de Aceite. Thank you very much, stick me down for a case. 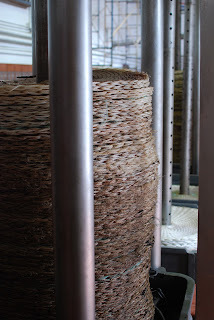 I found the whole thing fascinating, probably because the process is so beautifully simple, just like me. 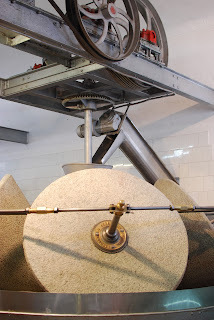 Also, I hadn’t really considered how olive oil was actually made, I mean, I had intelligently surmised you squashed the olives, but had absolutely no idea what the actual squashing operation looked like. Now I do. Artisanal squashy. 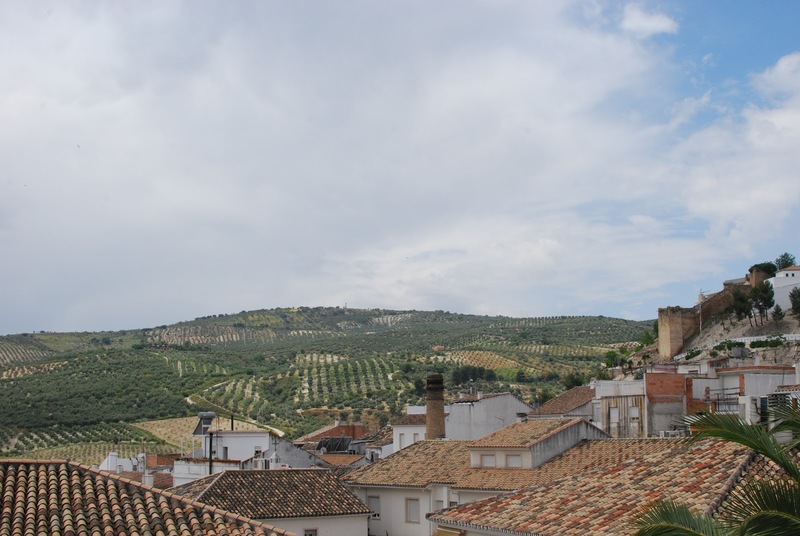 Afterwards we had a quick wander around Baena, noting that olives, somewhat unsurprisingly for a town surrounded by the things, are sold absolutely everywhere. Feeling a bit sharp-set and having an hour or so to kill before our bus back to Córdoba we wandered into a bar down the road from the bus station, where the bocadillos we ordered (despite taking an age to arrive, what with the kitchen actually making a tortilla from scratch for the filling) were each about the heft of a midget’s arm. These combined with some patatas and a bottle of water came to10 Euros. Bar La Tella, I salute you and your two-fingered attitude to proportion. 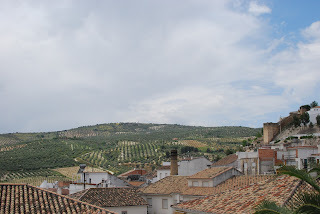 I have much to share with you all about Spain in the coming weeks. I basically ate and drank my way non-stop around three cities, no doubt forever ruining my health, just for this blog and its readers. I really hope all 3 of you appreciate it.